Dogs carry their toys in their mouths. 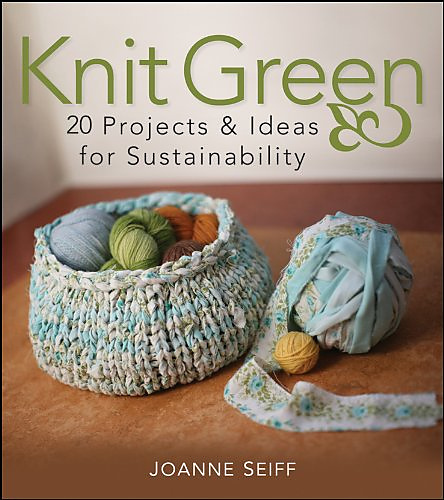 Wouldn’t it be better if the toys were made of natural, organic and safe fibers? You’ll find two options for each toy (Fetch and Bone)--a felted and nonfelted option, which are easy to adjust in size if your dog prefers something smaller or larger. 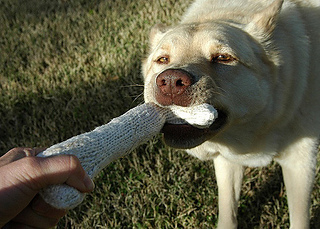 If your Fido is a big chewer, go straight to the felted option, and felt the toy hard to prevent damage. If your dog is a dainty Fifi and doesn’t destroy her toys, the nonfelted option is for you. 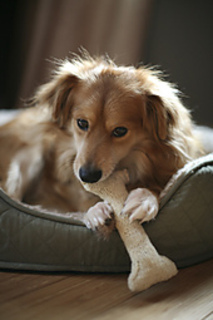 You might add a bell or a squeaker inside the stuffing if you’re sure it won’t be unsafe for your dog’s chewing habits. 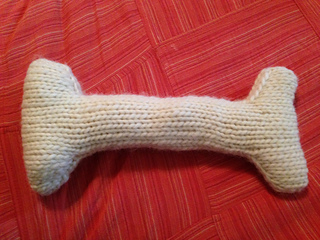 Unfelted Bone Gauge: 24 sts and 36 rnds=4” in stockinette on #2 ndls. Felted Bone Gauge: 18 sts and 24 rnds = 4” in stockinette on #7ndls. Unfelted Fetch Gauge: 24 sts and 40 rnds=4” in Houndstooth Check Pattern on #2 ndls. 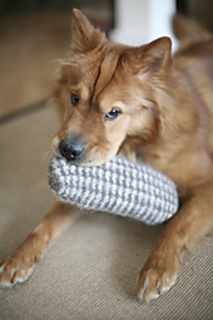 Felted Fetch Gaugge: 18 sts and 24 rnds=4” in Houndstooth Check Pattern on #7 ndls.